How to improve your life, push your limits and save the world. Earlier this month, I was sworn in as the President of my Rotary Club, the Rotary Club of Windsor (1918). The number in the name will tell you that this particular Club has just reached its centenary. I’m President # 101. You often hear about how service clubs (Rotary, Lions, Kinsmen etc.) are dwindling away – not to mention the stereotype of how it’s full of old people having lunch. Well, there may be some small truth in that stereotype. But lunch is only the smallest part of what we do, and the average age – at least in my Club – has come down significantly in the past few years. It’s not the business leaders all getting together. Now, Rotary is much broader of the world in general. I’m very proud to have been chosen as President of my Club. We have done much that is good in our community and in the world, and – as we start our second century of service – we have plans to do much more. 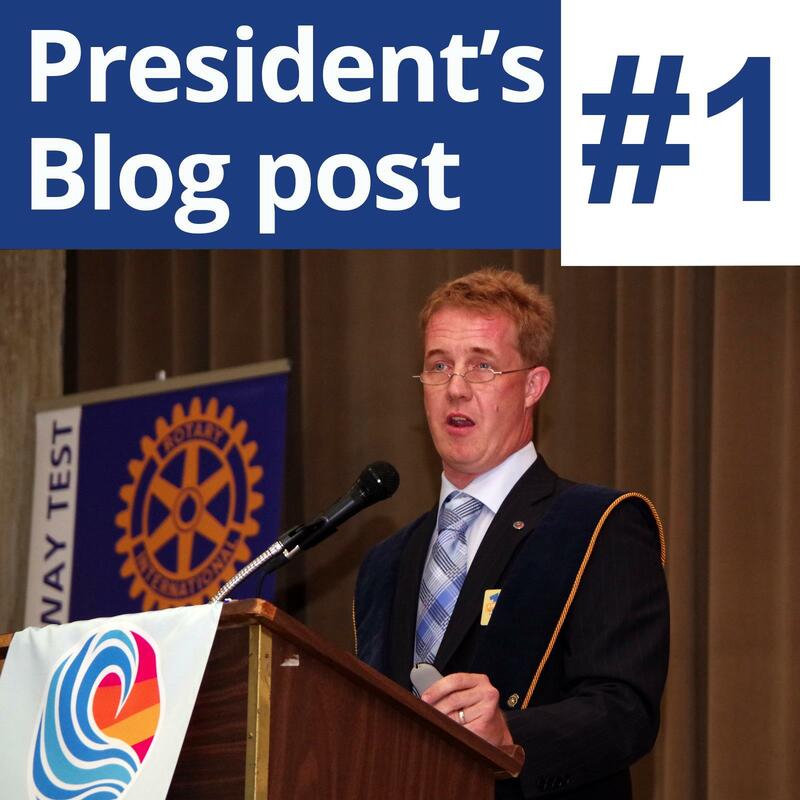 If you know me personally, you’ll know that I get a bit evangelical about the Rotary organization: its 1.2m members (about 500 of them in Windsor/Essex) do an amazing amount of good in the world. But I’d honestly say I’ve gained more from Rotary than it might have done from me. So…. as an accountant, I’d say that volunteering is a good investment of your time – in broader ways than money. Here are some reasons why. I joined Rotary because I had moved to a new hometown. Within a short period, I had met 100 people, all of whom had the same interests – to make the world a better place, and have fun while doing it – but who came from many different backgrounds from me. They range from early 20s to their 80’s. The one thing they have in common is a sense of optimism. Many have become good friends. Rotary is also ruthlessly inclusive. It does not acknowledge differences of politics, ethnicity or religion. And – although it only started to admit women 30 years ago – it has come a long way in closing that gap. In my professional circle, I spend a lot of timing talking business. And I’ve met many impressive people there, many of whom have created many jobs and also given lots of money away. But in Rotary I’ve met many people who inspire me in other ways: the dentist who goes to Central America every year to provide care to the rural poor; the retired teacher who spends hours making sure we can give a Christmas basket to hundreds of kids at Christmas; the Young Rotary Leaders in our group who arrange spin-a-thons to raise money for scholarships. All this stuff doesn’t happen by magic. It takes work and effort. I’ve become much more effective as a leader and an organizer – and I’ve learned by watching other Rotarians. Rotary’s also a very “lean organization” and very efficient at what it does. A couple of significant differences in the skills needed in my day job: (a) we often work with other Clubs, sometimes in other countries, which brings a whole new set of challenges; and (b) everybody’s a volunteer. So you can’t fire them…. See above. Further example: Rotary’s big global project – which is THIS CLOSE to success – is to eliminate polio from the face of the planet. 30 years ago, this horrible disease killed and maimed hundreds of thousands each year. This year, fewer than 50 cases on the whole planet. This was started by Rotary, and then the WHO and Gates Foundation came on board in a big way. No one individual has made that happen. But it’s really cool to say that you played a part in it. As you know, I have a desk job. And much of what I do in Rotary is what you might call “brain work” – organizing, coordinating, calling people. Time for a change. So…. time to do something different. 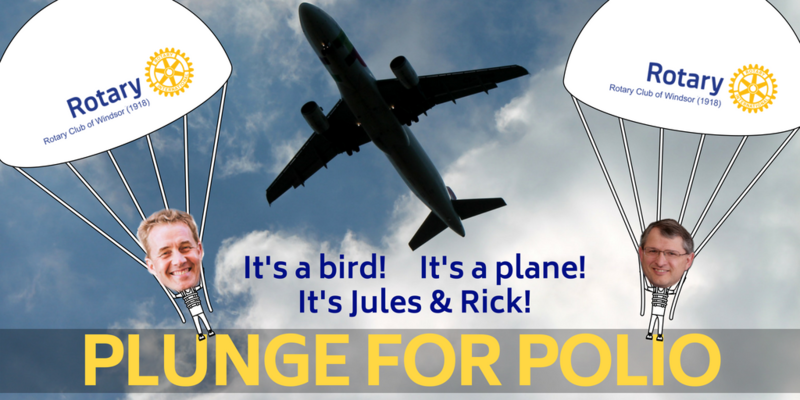 On July 28, I am throwing myself out of a perfectly good airplane, to raise money to help us end polio. Every penny of that money will go towards the final eradication of that terrible disease. Thank you for reading. Please think about volunteering for a service organization or other charity. And… if you can, please donate today.